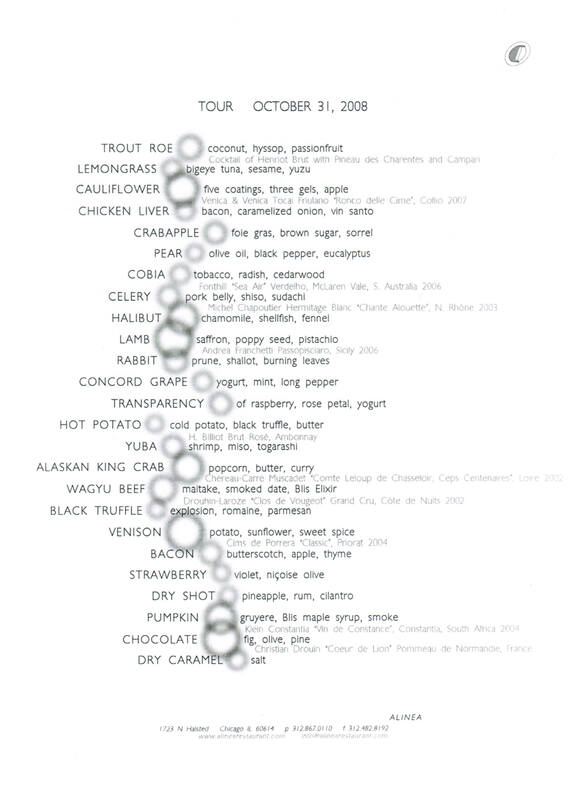 It was not an easy task for L2O to be our next meal after the tremendous evening we had the day before at Alinea. But i was not really worried. From what i had read on a few blogs (U.E. and Chuck), i was convinced that L2O could provide a lot of pleasure too and be maybe the best surprise of this trip. Restaurant L2O is located in front of the Lincoln Park, in a very nice area of Chicago North. After a 10 minutes taxi drive from our hotel, we arrived there at 8pm, on time and hungry (yes, yes, hungry…). Once we entered the restaurant, we were immediately seduced by the beauty of the place. Our table was nested in a little alcove, bringing a great intimacy and a small romantic touch, not bad at all. The table is in marble (or a sort of marble, no idea), with very comfortable seats. The service is quite young, probably the youngest we got during our stay but performed quite well and was extremely attentive to us. For the aperitive, we decided to start with a glass of white wine (a greek viognier from Skouros domain) and i immediately have a look to the wine list, again really attractive and offering a nice « by the glass » wine selection. For this last meal, we’ll go of course for the tasting menu, but no wine pairing this time, i wanted to try some american wines for my last meal and we selected a chardonnay from Dumol 2005 – really good and meeting 100% my expectations : buttered, oaked but still fresh and correctly balanced. This first small appetizer confirms the feedbacks i had : we are in a restaurant specialized in fish. And the fish quality here is of an extremely high level, even for this small first bite. This was confirmed by this second appetize where we got raw tuna matched with lime foam. And here comes the first starter : a fish i never ate before and i must admit it was absolutely stunning. What a quality of product, and what a finesse and subtile pairing with the wood scents and the shiso buds. I loved it. We loved it. This next dish was great but less surprising then the previous one. The yuzu and soy sauces are really good and we were happy they were here to bring some stronger tastes to balance the tuna itself. I miss the details of the dish. And this is a real pity as i remembered it being the best of the meal. First time of my life i’m eating tofu like this one. Amazing taste, enriched with the onions, sauce and flowers. Fantastic. For this next course, we were served fresh and raw mackerel, first time i eat mackerel in such a way. And in opposite of the tastes i was used to have when eating such fish cooked and caramelized, it’s of an absolute sweeteness here and brillantly paired with a light olive oil and some cucumber thin slices. Lovely. This course was the most impressive course of the meal from a visual perspective. I enjoyed the arrival of the dish on the table, and was positively surprised by the first bites i took. That was the single disappointing dish of the evening. It was nice, good, but had nothing exceptional too. Probably due to the cooking of the swordfish, slightly too overcooked for me. This next course brings this meal again at the top. A very delicate dish, perfect cooking of the squid, a light and creamy sauce and very tasty taglioni : excellent again. First time i got skate wing prepared like this and it was really interesting. The concept of serving it slightly caramelized with asparagus and mainly bordelaise sauce gives this dish an originality that was very successfull. Great quality again of the fish : very good. I was questionning myself how a restaurant focusing so much on fish will serve and assume a meat course. Actually, it was good but not reaching the same quality level of the fish courses we had before. The truffle taste is well balanced with the potatoes while the pork is really well cooked but it doesn »t bring you to the next level where you are thrilled by what you eat. It was good but not unforgettable. Back to some fish again, and we liked it. Some hot bouillon was served together with a set of raw fishes we had to cook using the bouillon. It was the best possible end to this meal : incredible quality product, we enjoyed a delicious moment there tasting all these fish pieces. I must say that except at Eleven Madison Park, i’ve found all the desserts we had (at WD50, Alinea and now here) from a very good level, probably higher from what i’m used to experience in France. This one here was again very good, bringing tastes straight to point but not to strongly, neither heavy. Eating this one, i remembered the souffle i ate at Pierre Gagnaire 2 weeks before (i couldn’t finish it). This praline souffle is this time light and easy to eat, the praline taste and souffle texture are cleverly balanced in a way that this dessert can easily be eated. Great. It never ended… what a nice meal again. From a quality perspective, and focusing on fish only, it’s one of the best fish menu i ever enjoyed. The desserts and mignardises were perfect too. It’s not only innovative and good, it’s also about discovering new products and cooking methods. L2O succeeded in that higher that we could have ever imagine. 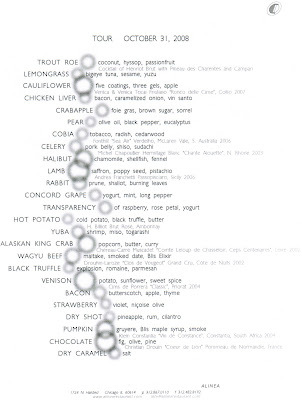 And after the pleasure and emotions we got at Alinea, we really enjoyed L2O thanks to the already quite strong and solid food identity they demonstrate. Except this swordfish course, really below the others, it was an excellent meal, in a fine and delicate atmoshere, served by a great and young team. 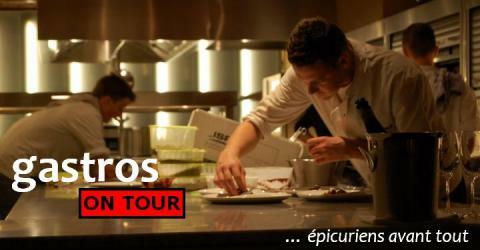 Definitely a must for any foodie traveller to Chicago. Before leaving the dining room, i asked to meet the chef (a french chef : Laurent Gras) but he was already gone : that was actually the single regret we had leaving L2O. This closes a 5 days trip and 4 very good and different meals. I would visit each of them for sure again if i have any opportunity in the future. But not short term as my next trip is now scheduled in February 09 and Tokyo will be our new destination !